Have you ever come home from work and looked in the fridge to discover that there is no food in the house? When I found myself in this situation, I challenged myself to respond like the chefs on CHOPPED. Those inventive chefs compete against each other to come up with a meal based on oddball items in a market basket. A cooking strategy I picked up from Luke and Steve is to start chopping and sweating onions and celery. This buys me a bit of time time while the creative juices start flowing. 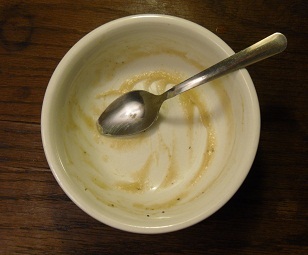 Eventually I put together a pretty decent tasting soup. It must have been good because this is the only picture I was able to capture. 1. Heat olive oil in a heavy pot. Add onions, celery, and green peppers and sweat until soft. 3. Add celery, onions, turnips and green peppers and blend until smooth and creamy. 4. Boil potatoes in another pan. 5. Heat vegetable broth and mixture from the blender. Add potatoes when cooked and mash slightly. 6. Heat and season soup with black pepper and rosemary. Serve immediately or save for another meal. Here is a recipe I found in The Plant-Powered Diet by Sharon Palmer, RD. This is the book that I mentioned in the Phytos First post. 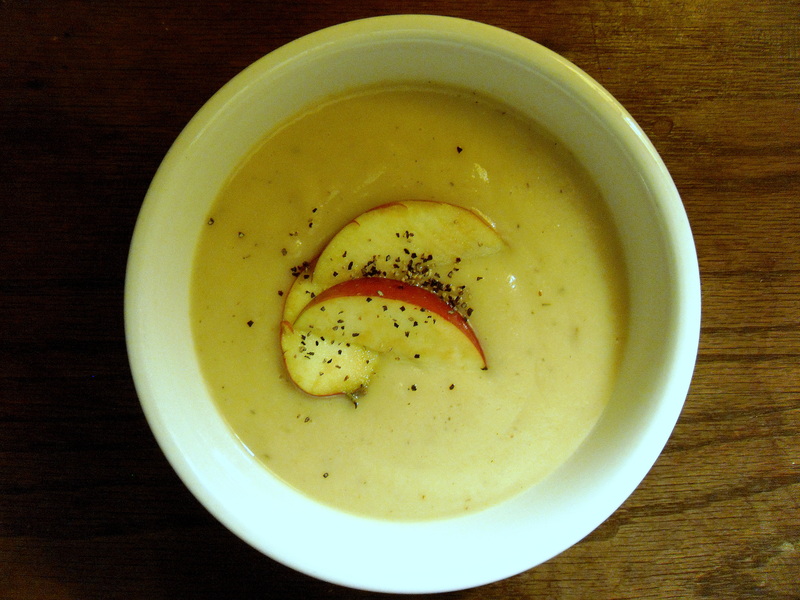 When I looked in the CSA box, and saw celery root, I remembered this soup Francine made back when she taught me about celeriac for the first time. Then I saw the apples in the box and decided to try a recipe from the new book I purchased. According to Ms. Palmer, the phytochemicals in celery root have been linked to brain protection. Heat olive oil in a heavy pot. Add leeks, potato, celery root, celery stalk, apple, thyme, and black pepper and saute for 10 minutes. Add broth and water and bring to a boil. Reduce heat, cover and simmer for an additional 40 minutes, stirring occasionally. Transfer mixture to a blender and puree until smooth. Add the milk and process until blended and serve immediately.